Three hundred academics and public intellectuals joined to launch a manifesto denouncing the detention of the former Brazilian president and current Presidential candidate Lula da Silva. The petition discusses in detail the arbitrary nature of the trial conducted by Judge Sergio Moro against Lula da Silva, stating that he is nothing less than a political prisoner. The document asserts that the international community should treat him as such and demands his immediate release. Read more here (your truly signed too). 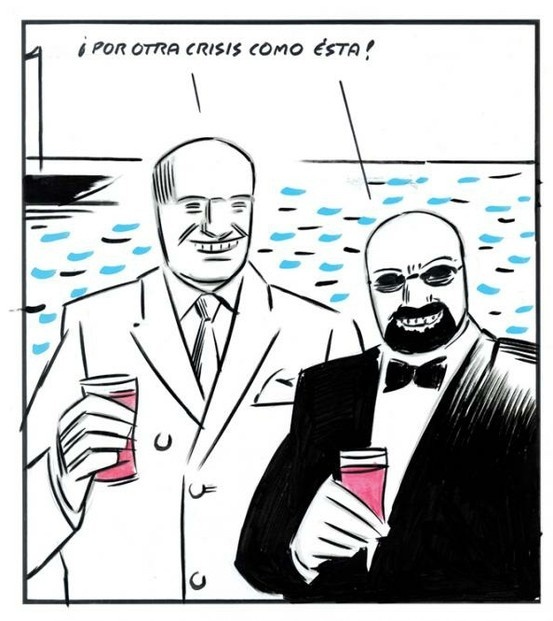 Here is to another crisis like this one! liberalization and loose and unregulated lending practices. This round-table discusses a range of topics on teaching heterodox economics, including MMT. Fernando, Cardim for most in Brazil, and Carvalho in the US and abroad, has sadly passed away. I took his macro class back in 1992 at the Federal University in Rio, before he actually moved there definitely as full professor two years later. We used his book Mr. Keynes and the Post Keynesians (still somewhere here in my bookshelf) as a textbook, even though most of the course was based on several papers. From that period I remember reading his papers on time and expectations, which were two of his main concerns within post-Keynesian economics. Although much of his course was theoretical, most of his later work seemed to be related to the workings of international financial institutions, and real world macro issues. He wrote extensively, and there are papers on the role of the IMF, and critiques of the idea of central bank independence, besides discussions of the Brazilian economy. My favorite paper is based on his discussion of Keynes' political views, and to what extent his policy proposals can be seen as close to social democracy. A great loss for the profession, for his students, and for his friends. No 'On the Blogs' section last Sunday (was traveling) and slow to react to events (at a pedagogy seminar for a couple of days, learning about teaching techniques). At any rate, the good news is that Naked Keynesianism has been featured in the Intelligent Economist's Top 100 Economics Blogs of 2018. According to them they have "made an effort to create a well-balanced list which contains blogs of all kinds political affiliations, schools of economic thought, and beliefs, in particular by focusing on smaller blogs and female economists." Pluralism does work, after all. This was faster than even I expected (for my views on what Macri meant as soon as he was elected see this and for a more recent assessment go to this post). Let me first say that I don't think is quite like the 2001/02 crisis. It is unlikely that there will be a default anytime soon. The level of reserves is at about US$ 56 billion, and the IMF is happy to finance the very Neoliberal government of Macri (because the IMF has changed a lot, remember?). The economy with Macri has not performed very well, as expected. Inflation has remained high, since the depreciation of the peso has persisted, and that was no accident. It allowed to erode real wages, which I noted from the beginning was part of their goals. Also, the rate of growth has been lackluster, and if the IMF is to be believed real GDP growth in his first two years was on average at around 0.5 percent. Again, I don't think that has been a central concern (even if they suggest the opposite). Note that again a relatively low rate of growth (as per Okun's Law) leads to slow job growth (formal unemployment is above Cristina Kirchner), and less wages pressures. In Argentina, economic policy is truly geared towards containing wage resistance, when you get a Neoliberal administration. 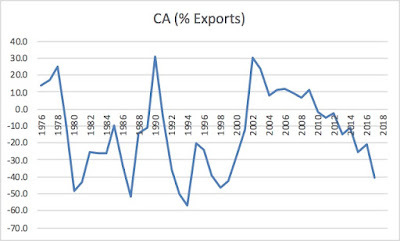 So Macri liberalized the foreign exchange market, further liberalized imports, in crucial sectors where there was a significant repressed consumption by the middle and upper classes, like electronics, and that led to a significant increase in imports, not matched by increases in exports (even with the depreciation of the peso; as it turns the depreciation of the currency is inflationary, and by reducing real wages, contractionary, but it does not increase exports by a lot, which depend on foreigners incomes for the most part; who could have foreseen such an effect! ), and they resort to foreign borrowing to close the gap. Again using IMF numbers, that are estimated for 2017 (and I should note and not very reliable since inflation data is also not very good. A bit enervating given how much the opposition to the Kirchners complained about the quality of inflation data, and the notion that would not happen with them) we get the following picture for the current account (CA). Clearly the external situation has worsened significantly. Don't get me wrong, I don't think the recent run on the peso has been caused directly by the CA position. This is more like the long term problem. If you liberalize imports, and the patterns of consumption are such that imports explode, but your pattern of specialization is the production of commodities, and you solve this by borrowing in foreign currency, it cannot end up very well. And it won't. Btw, yes I did say back in 2016 that foreign debt driven growth was dangerous and eventually unsustainable at the time that Moody's was upgrading Argentina. So what caused the recent run on the peso, you ask. Not sure, to be frank. The Fed in the US has been signaling higher rates (and they went up a bit), and that causes trouble for sure. And the Macri team, which has some from the Menem/de la Rúa Neoliberal Era (like Sturzenegger at the Central Bank), is not very competent (not sure why FT thinks they are pragmatic and in between the Neoliberals of Menem and the 'heterodox' of the Kirchners), and kept interest rate really low (for distributive reasons alluded above) allowing for depreciation. At any rate, the turbulence might be temporary, but the issue is not, and Argentina is headed for more problems. * On this John Williamson, and his views on competitive exchange rates, did not reflect well what the consensus in Washington (meaning the IMF, World Bank and the US Treasury) really thought. PS: If you read Spanish, you must check this short piece by Fabián Amico and Mariano de Miguel (h/t Edurado Crespo). Best I've read so far. PS2: Forgot this one by Claudio Scaletta in Página/12, also worth reading, as everything Claudio writes. A bit old, from 2016, but not too old, and very apropos given the recent heightened trade disputes between the United States and China. This paper provides an empirical analysis of nonfinancial corporate debt in six large Latin American countries (Argentina, Brazil, Chile, Colombia, Mexico, and Peru), distinguishing between bond-issuing and non-bond-issuing firms, and assessing the debt’s macroeconomic implications. The paper uses a sample of 2,241 firms listed on the stock markets of their respective countries, comprising 34 sectors of economic activity for the period 2009–16. On the basis of liquidity, leverage, and profitability indicators, it shows that bond-issuing firms are in a worse financial position relative to non-bond-issuing firms. Using Minsky’s hedge/speculative/Ponzi taxonomy for financial fragility, we argue that there is a larger share of firms that are in a speculative or Ponzi position relative to the hedge category. Also, the share of hedge bond-issuing firms declines over time. Finally, the paper presents the results of estimating a nonlinear threshold econometric model, which demonstrates that beyond a leverage threshold, firms’ investment contracts while they increase their liquidity positions. This has important macroeconomic implications, since the listed and, in particular, bond-issuing firms (which tend to operate under high leverage levels) represent a significant share of assets and investment. This finding could account, in part, for the retrenchment in investment that the sample of countries included in the paper have experienced in the period under study and highlights the need to incorporate the international bond market in analyses of monetary transmission mechanisms. A while ago I promised to return to this topic and discuss Mirowski's reply in the INET debate to my comment on his paper. And yes it's been quite a while since that debate. 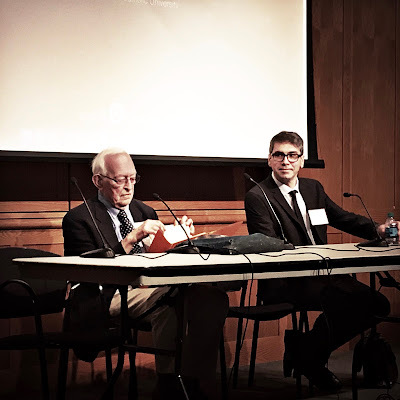 At any rate, I was at the Political Economy of World Systems (PEWS) conference last weekend, and we had some time to discuss Wallerstein (with him, I'm glad to say), his views on the structural crisis of capitalism. And someone (can recall who did) said something to the effect that the collapse of the economy in 2008 and the events after that (particularly the European situation with Brexit and the rise of right wing populism) suggest that the Neoliberal era is over (that was the title of a subsection of a chapter in David Harvey now classic book on Neoliberalism). So let me tackle that issue, captured beautifully in Blyth's tweet above (mind you mark might have been talking just about Neoliberalism in the US, as Cornel West did here), and in the process make the two brief comments I wanted to add on Mirowski. And to make sure, I don't think the era of Neoliberalism is over, in the US or globally. In fact, in many places Neoliberalism is resurgent (certainly in Latin America; I'll have something to say on Argentina soon). The first issue, before one can discuss whether it ended or not, is what it was. Mirowski says that neoliberals are not just or fundamentally neoclassical, libertarian, classical liberals, or conservatives, and that they have, to some extent, created the confusion. That is in a sense the negative definition of Neoliberalism. "... neoliberal doctrine instead set out actively to dismantle those aspects of society which might resist the purported inexorable logic of the catallaxy, and to reshape it in the market’s image. For neoliberals, freedom and the market would be treated as identical. Their rallying cry was to remove the foundation of liberty from natural rights or tradition, and reposition it upon an entirely novel theory concerning what a market was, or should be." 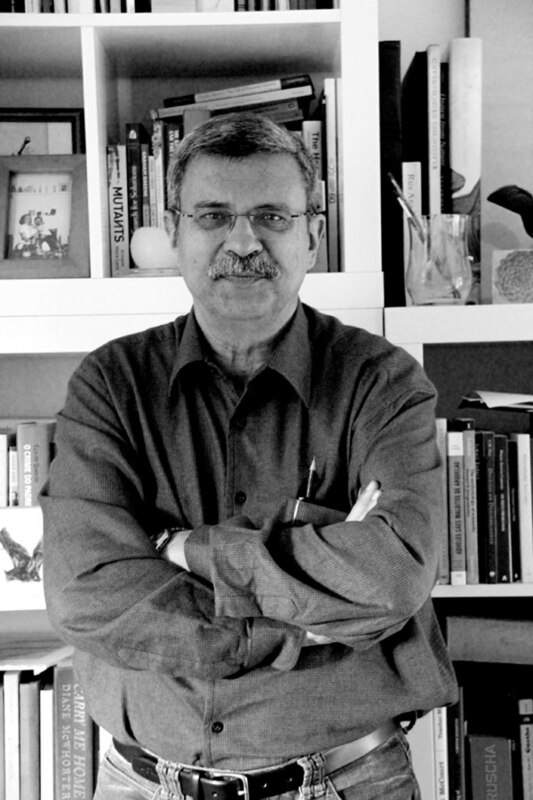 In his view, Neoliberalism is a movement, and not simply a set of ideas (like for example, Keynesian macroeconomics or classical political economics). And again, I must emphasize that I do agree with him, that it is a movement that revolves around the Mont Pèlerin Society (MPS). 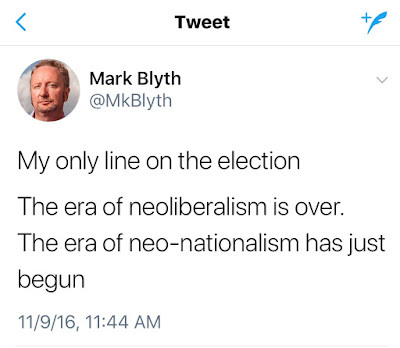 He refers to the group as the Neoliberal Thought Collective (NTC). A scientific community in the same mold of Thomas Kuhn's normal scientists. Harvey, in the above mentioned book, argues that it is a movement whose goal is to reestablish the power of capital, and disembed capital from the welfare costs imposed during the Keynesian consensus era. And certainly that seems to be the glue of the group. However, in his response to my comment, Mirowski suggests that I commit a mistake in suggesting that Neoliberalism is subsumed in (a subset of neoclassical economics). And of course, in a certain way, if you think of a movement, it would seem that I had it indeed incorrectly and that neoclassical might be part of the Neoliberal group, but many Neoliberals are not. However, while it is true that in that sense Neoliberalism is broader than neoclassical economics, since its scope is wider, and less of school of thought than an ideological movement, it is also true that as a movement Neoliberalism must substantiate its arguments on the basis of a set of ideas (as Keynes dixit, ideas govern the world, not vested interests). Neoliberalism could be seen as an ideological movement to promote the vested interested of capital, after the significant reforms of the Keynesian consensus, a Polanyian counter veiling movement created by the success of the expansion of the welfare state in advanced western economies. But it was an ideology built on the notion that markets provide the only organizing principle in society, an idea that is probably associated to Hayek and his Austrian School. Note that while Hayek, in particular after the intellectual defeat in the 1930s in his debates with the Cambridge Keynesians, turned to political philosophy as his main preoccupation, his economic views remained essentially unreconstructed. Even though there are methodological differences between the Austrian version of marginalism and the Chicago School, to suggest as Mirowski does, that Hayek, and other Austrian scholars were not neoclassical is difficult since both are founded on the idea that relative prices depend on supply and demand. All Neoliberals fall back into some form the mainstream marginalist story in which equilibrium prices are determined by supply and demand, including the prices of labor and capital, and that includes Hayek and Austrians. The market is the totemic myth that provides overall coherence to the movement, and an aura of scientific rigor to the policy proposals. Each clan would have their own version of the myth, so to speak, with the more common being the Arrow-Debreu General Equilibrium (GE) model, and the Austrians emphasizing the self-organizing principles of the market. In that sense, neoclassical economics is the theoretical foundation for all versions of Neoliberalism, whether Neoliberals understand it or not (some Austrians believe they are not neoclassical, but their confusion should not cloud our understanding of facts). The second issue has to do with Mirowski's argument that “the real key to understanding modern economics is the absorption of the central tenet of markets as superior information processors within the heartland of cutting-edge microeconomics.” In fact, neither Hayek’s argument for the spontaneous, self-organizing nature of the market, nor the retreat to the validity and generality of the Arrow-Debreu GE model, both providing a flimsy response to the internal critiques of the marginalist model, were able to provide a simple policy relevant model. It was only the policy relevance of the Friedmanite simple macroeconomic model that created the conditions for the NTC to promote the economic policies that reversed the Keynesian consensus, not just theoretically, but in the real world of economic policy. That is, the return of the idea of the natural rate, even after being discredited by the capital debates (something I referred to as the return of vulgar economics). Back to the end of Neoliberalism, now that one may understand my argument of why neoclassical economics is at the core of the movement. Almost a year and a half into the Trump experiment, what we got is a lot of rhetoric on protection, immigration and so on, but the only concrete thing is a tax cut for the wealthy. That Trump would not really be a populist was evident by his choice of Pence, a Koch financed career politician, as vice-president. Neoliberalism has survived the greatest financial crisis since the Depression, and is doing fine in both the GOP and the Democratic Party. The notion that it is dying because there is some push back and it is contested in some quarters is wishful thinking. Trump just provides a different flavor of the same. Note that there is no serious change in the profession about the way we think, and neoclassical economics is doing just fine. I have been skeptical about the notion of changes in the profession after the crisis (and of the IMF policies too). The reason, the underlying theoretical reason, for the persistence of Neoliberalism in economic policy can be seen in the reluctance to abandon Milton Friedman's natural rate of unemployment concept by self-depicted (New) Keynesian authors.